This work was a finalist in the 1949 Wynne Prize and was acquired by the Gallery in 1949. Signed and dated l.r. corner, pencil "nolan/ 25-5-48". James Gleeson., Sun , 'Gallery purchases for 1949', Sydney, 19 Dec 1949. Art Critic (Paul Haefliger)., The Sydney Morning Herald , 'An exhibition that merits compliments', Sydney, 20 Dec 1949. 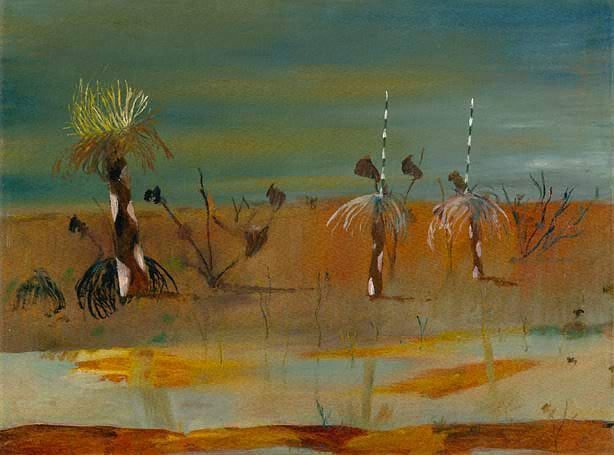 Tatlock Miller., Sun , 'Amazing impact by Australian artist', Sydney, 08 Mar 1949. Review of Nolan's exhibition of outback paintings held at David Jones' Art Gallery. They kill you in the end , 'Trustees', pg. 24-44, Sydney, 1973, 28.